Hi. My name is Neil and I’m a footy addict. On Friday night I realised I need help. The Bulldogs game had been in progress for two hours and I was visiting friends who had no interest at all in football. The offer came to switch on the TV to see the last quarter and I declined because I hadn’t quite hit rock bottom. I was in the early stages of footy-craving denial where I was still polite and feigning interest in reviewing the movie we had just seen. In reality I desperately wanted to know how the Dogs were going down at Geelong. Just a short time later all resistance was gone and I asked the host to turn on the TV with the volume down…just so I could check the scores. Just to check the scores. Yeah, right! Like any addict, I was about to get a taste, but I knew I’d be wanting more! If anyone in that room suggested we turn off the TV and adjourn to the dining room, they would have had to remove that remote from my dead, cold hand. As I scanned the three-quarter time scores and saw the Bulldogs were 27 points down, I berated my self for being so weak and not waiting to get home later and see the entire match on replay. When there’s a chance of a quick fix, it’s all about instant gratification and two hours is a long time to wait when you’re a footy addict. Only four goals down at three-quarter time and that little voice in my head was telling me there was a chance of a big upset as long as I concentrated and didn’t miss a second of the last quarter. The voice also told me to ignore anyone in the room who wanted to start up conversations about films, favourite restaurants and real-estate. Then the cameras panned in on Tom Liberatore and Jack Macrae wearing track-suits and hobbling out to the three-quarter-time address.. The realisation that the Dogs had lost two more key-players to injury sent me into a state of shock and despair. I knew I needed help when I could sense the non-believers were sniggering as they watched me becoming so fully absorbed in the match. They were laughing because they couldn’t believe anyone could care so much about a football- team and the outcome of a match. They were also laughing because I was twitching and writhing in my chair as I rode every kick, handball and mark, reminiscent of that famous footage of Leigh Mathews in the coach’s box. How did it come to this low-point? Why do I end up being the only person in the room who cares so much about the outcome of a football-game? In 1977 I borrowed a small colour TV from someone at work to watch the first direct telecast of the Grand Final between North Melbourne and Collingwood. The non-believers had left the room so I was all set for my George Costanza ‘ Summer of George ‘ afternoon. Unfortunately a mate from Queensland arrived unexpectedly assuming I would be going to the pub with him to catch up and relive our trip around Australia when we were young and free. Of course I chose to watch a football-match over that friendship of many years, such was the hold of my footy addiction. In 1990 the non-believer organised a house-warming party at our place just after we moved to the country. It was Grand Final day so of course everyone was available… because they were all non-believers! I had to get my footy-fix by sneaking away from the BBQ after making excuses about getting something from the house, just so I could find out if Collingwood were going to break their premiership drought. Worrying about the fate of Collingwood was an all-time low point in my addiction. I should have sought help even at that stage. It was certainly different watching the last quarter first on Friday night. Initially I was thinking about the possibility of an upset win after realising the Bulldogs must have started the match well to be so close to the Cats. But all that hope and expectation was tempered by knowing there were two more injuries to star players. Thoughts about how the team would manage over the next few weeks and during the finals over-rode any thinking about the chance of an upset win. In the early hours of Saturday morning I watched the first three quarters of the match. It wasn’t the case of getting the munchies late at night and unable to sleep because of my addiction. We didn’t arrive home until about mid-night so it was my first chance to see the replay. Alone again naturally. The Bulldogs were within a point at quarter- time and one goal at half-time so it made for good viewing even if I knew who won in the finish. The attack on the ball by players such as Liberatore was the best I had seen since the team had blitzed Freo in the first game of the season. Libba and Macrae were taking it up to Selwood and Dangerfield and actually beating them in some areas, so to lose them both later to injury tipped the contest in favour of the Cats. As usual the Bulldogs had plenty of entries into the forward fifty but couldn’t convert often enough. Our only tall on the forward-line, Boyd, was also being used in the ruck and doing well, but the Dogs were missing Redpath who was one of last week’s casualties. Cordy and Hamlin were doing their best as replacement back-men, with Cordy even having a run on the forward-line and kicking a goal. Leigh Mathews belief that when one soldier goes down another one is always ready to take his place was questioned on radio the other day and I tend to agree. It is more when a star- player is injured that makes a difference when he is not easily replaced by another average player. At the moment there are are about 10 first-choice Bulldog’s players not available through injury and to get within 25 points of Geelong was regarded by commentators as a really brave performance. I’m not sure how many of us there are out there, Neil, but I wouldn’t get too concerned about it! Just do what I do: I NEVER accept invitations to ANYTHING if it clashes with the footy, especially my team’s game. I’m still forgiving myself for deliberately missing my sister’s wedding because of my addiction to South at the time. And, as you’re probably aware, the addiction seems to become worse as we get older! Thanks Jan for reminding me I am not alone with my affliction. I too check the fixture before accepting any invitations during the footy season. I slipped up badly last Friday when my wife said it was a fund-raiser we were going to and like the conniving George Costanza looking for an out…I had nothing. My daughter was due to be married on Grand Final day 2000 and I went into panic-mode thinking I would have to wear an ear-piece secreted on my person, but fortunately they changed the date to the day after the Grand Final. How considerate of your daughter! I didn’t have the nerve to ask my sister to change hers to a Sunday instead of a Saturday, so the only option when driving from Brissie to Melbourne for the wedding was to take a detour to the MCG. At least we actually won! I’m moved by your plight, but I understand that the first stage in dealing with any addiction is the acknowledgement. I have my own stories for two pf the dates you mention, the 1977 and 1990 Grand Finals, coincidentally both involving Collingwood. So many football dramas seem to involve the Magpies for they surely provide tragedy and farce. We were actually in Mortlake for the 1991 Hawthorn d West Coast at Waverley, and watched the telecast at a uncle’s home before celebrating his 60th birthday that night. I can fool myself that I’m not mainlining. Four years ago, the night on which Brett Ratten lost his job, when the Blues succumbed to Gold Coast, I was at another 60th birthday party. The guest of honour is completely indifferent to football, but her husband is a fanatical Saint. There was no question of the tv being switched on, but the males at the party were keeping track of the scores, and from time to time alerting me the impending calamity. I am proud of my equanimity in the face of humiliation on that occasion. I attribute my stoicism to the harshness of my rural upbringing and years of enduring sub-par performances by my benighted team. Neil – it is a great thing to care. Sadly not many people do – about anything. The Dogs were good when they had all their players up and about. Very good. Every team needs a bit of luck. The Dogs have had none. Any team that strikes them in September will have a fight on their hands. I used to be like you Neil, but I find a lot of other sporting and non-sporting interests these days. I watch a lot of games for 15 minutes (including the bloody Eagles away games this season) and if they are predicably boring I find something else to do. Beveridge (because of injuries) and SImpson (because of our lack of form and confidence) are setting up with large numbers behind the ball and try to force a lot of stoppages to regroup and redistribute players. Its really boring and crap to watch when there are 101 tossups followed by the inevitable scrums and if you are lucky a forward kick to a 1 on 3. Its crap to watch. Leave me out of it. I find better things to do with my time. Best games I see all week are on the Winners Rebooted from the 80’s. Last night was a 5 point last kick Bulldogs win over the Magpies at Western Oval in 1984. Bliss. On a happier note I thoroughly recommend that all Bulldogs and Saints tragics (and all Knackers really) catch up with an ESPN 30 for 30 documentary called “Believeland” that screened last night on Foxtel. It will be on Anytime for those with a box to download repeats. Its the story of the last 50 years of Cleveland pro sports (Indians – baseball; Browns – football; Cavs – basketball) with all the related tragedies, near misses, fumbles, hopeless jokes, jinxes etc. Told through the eyes of fans, players, commentators and owners/local pollies. Now updated with the redemption ending of the return of LeBron and the Cavs 2016 triumph. The concluding shots of the current day champs welcoming the “near miss” stars of the 60’s, 70’s and 80’s near misses from football and baseball onto the cavalcade bus is really heart warming. Hope you get to catch the bus one day yourself Neil. So comforting to know I’m not alone. Thanks for all the comments and as Andrew said, it’s good to know I’m not alone. At least you got to watch the footy at Mortlake after the birthday party Peter. I find the locals here are more interested in the local footy, so if the Dogs have a big win or I want to tell someone about all the Bulldog injuries, there’s not a lot of interest. It is good to have something to care about besides your immediate family Dips. To be able to write about it even the tongue in cheek stuff on the Almanac, is a bonus. Peter B, I am not quite at your level of consciousness. I need to see at least one Grand Final win in the next couple of years before I lose my addiction for watching the Bulldogs. Then I might give myself the luxury of checking out other sports after I catch the bus as you say. Of course GF day is sacred Rulebook and I’ve only been caught out a couple of times recently. These days my family clear out and leave me to it with the beer and snacks and the TV. If the Bulldogs ever win one of course I hope to be there. My fantasy is to have a week in Melbourne so I don’t miss a minute of the celebrations. Sorry folks – GF day is not always sacred. The first manifestation of my addiction was on GF day 1973 when, as a 9 year old, I was required to attend a family wedding (morning service, afternoon reception, if you don’t mind), and had to pass up the offer of a ticket in the MCC members to see Richmond maul Carlton. It was particularly rough that I’d been to the previous year’s Granny and endured Carlton’s 28 goal haul against the Tiges. Some people have no consideration!! It was in the days before live TV coverage but I managed to skulk off as soon as the speeches were done to find a radio and a quiet room. I vividly recall listening to the Captain and the Major (3KZ IS Football!) describing Laurie Fowler decking Big Nick in the opening minutes. It seemed an eternity before Nicholls was finally revived and goaled from the free kick and my heart sank as the prospect of another Carlton win took hold. Happily things looked up from there! I think I might even have returned to the reception later that afternoon with the game safely in Richmond’s keeping. I’ve managed my addiction pretty well over the years. As with any addiction, planning and pretence are important, although I’ve also found that a bad trip – such as season 2016 – quickly reduces your craving. Your piece of writing is very interesting. I love it!! I wonder if you felt lonely at such occasions where others were not intersted in our entertaining footy or not. Couldn’t you tell them how footy was interesting and attractive? I remember I just read the Age footy articles on my phone when I had tough time and got bored what others talked back in Sapporo a few years ago. When no one is at work, I tune in Watch AFL app to watch footy live. Not only St Kilda games but also Bulldogs games are on my favourite list. Others could include Hawthorn vs Geelong blockbusters, Sydney vs Carlton and much more. It’s good that we both are addicted with footy, isn’t it? I don’t think you overcome addiction with Bulldogs. Geelong have strong defense line so it’s hard to break to score goals. I hope Doggies will win over Cats next time. I can take or leave footy. Have been doing so for nearly 50 years. Good to hear from my fellow footy-addict Yoshi. It is a waste of time trying to tell people who aren’t interested in footy that it is attractive and interesting. Some people just don’t get it. Also I was brought up with footy in the Melbourne suburbs where I first became addicted and local people here in the country have had a completely different experience with footy. Swish, surely you have taken footy more than you have left it. Perhaps the hold of barracking for Adelaide teams was not as strong for us following our Melbourne suburban teams. At least footy has given you and your daughter plenty to write about. I’m sad to hear that it’s the waste of time to attract your mates into footy. It’s surprising that some people in countryside are not interested in footy at all. Do they follow local footy instead? Then playing Barallat seems important for your Bulldogs. Last night I was unhappy that my boss came to the inn at 9 pm when I had just finished working. She crossed the line of footy zone (indeed work free zone). It was rally annoying. I was about to watch last minutes on Richmond vs Collingwood. I missed watching Tigers roared and how they embraced after the terrible two weeks. And I missed hearing their club song. It was so so frustrating. It came due to my footyholic that is good for us. I should have behaved like Mick Malthouse hiding somewhere (he put a Hyundai poster at the coach’s box at SCG). I hope your Bulldogs win tonight! Sorry to hear you are still suffering as an addict Yoshi. Nothing worse than having the boss come in before you could see and hear the Club song of a team you don’t even barrack for. I’m guessing it would be hard to explain to her why you were upset about missing part of a broadcast of a foreign game that she probably has never heard of. Maybe you and I need to book in to a clinic that can help us with our addiction. 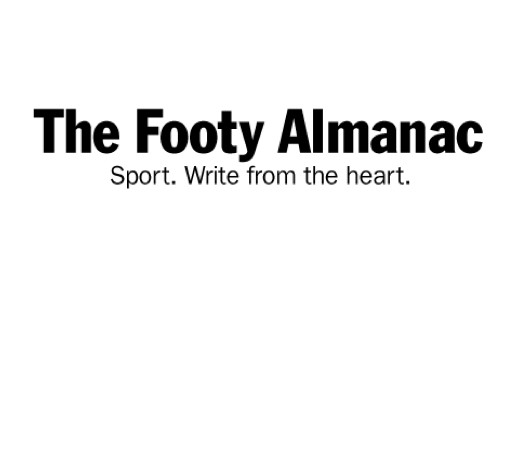 Perhaps it can be run by the anti-football league that was run by a Herald-Sun writer Keith Dunstan where they have a square (non-bouncable) footy as their logo. Really hoping the Dogs win tonight. Enjoy the footy with Yvette.